a succession or recurring series of events. 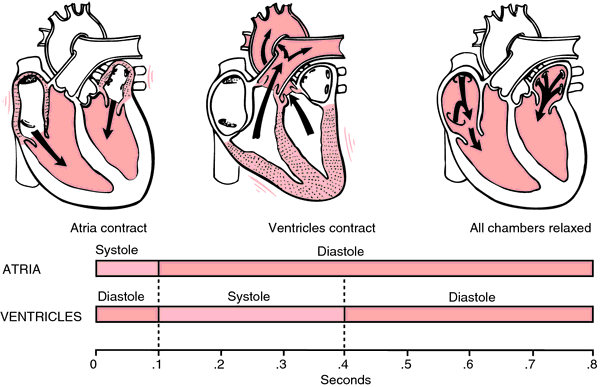 cardiac cycle a complete cardiac movement, or heart beat, including systole, diastole, and the intervening pause. Cardiac cycle. From Applegate, 2000.
cell cycle the cycle of biochemical and morphological events occurring in a reproducing cell population; it consists of the S phase, occurring toward the end of interphase, in which DNA is synthesized; the G2 phase, a relatively quiescent period; the M phase, consisting of the four phases of mitosis; and the G1 phase of interphase, which lasts until the S phase of the next cycle. citric acid cycle tricarboxylic acid cycle. estrous cycle the recurring periods of estrus in adult females of most mammalian species and the correlated changes in the reproductive tract from one period to another. hair cycle the successive phases of the production and then loss of hair, consisting of anagen, catagen, and telogen. Krebs cycle tricarboxylic acid cycle. menstrual cycle see menstrual cycle. ovarian cycle the sequence of physiologic changes in the ovary involved in ovulation; see also ovulation and reproduction. reproductive cycle the cycle of physiologic changes in the reproductive organs, from the time of fertilization of the ovum through gestation and childbirth; see also reproduction. 1. the physiologic changes that recur regularly in the reproductive organs of nonpregnant female mammals. 2. the period of sexual reproduction in an organism that also reproduces asexually. TCA cycle tricarboxylic acid cycle. tricarboxylic acid cycle the cyclic metabolic mechanism by which the complete oxidation of the acetyl portion of acetyl-coenzyme A is effected; the process is the chief source of mammalian energy, during which carbon chains of sugars, fatty acids, and amino acids are metabolized to yield carbon dioxide, water, and high-energy phosphate bonds. Called also citric acid cycle, Krebs cycle, and TCA cycle. 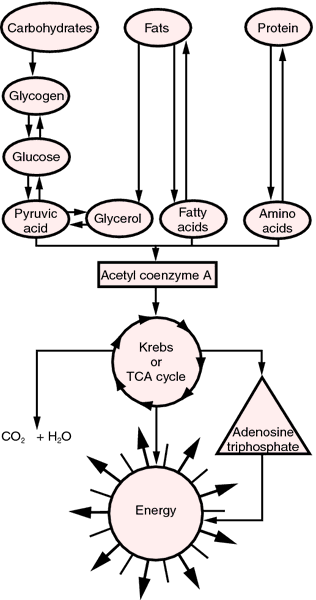 Central pathways of metabolism: How the body produces energy from the energy-containing nutrients using the tricarboxylic acid cycle. From Davis and Sherer, 1994.
urea cycle a cyclic series of reactions that produce urea; it is a major route for removal of the ammonia produced in the metabolism of amino acids in the liver and kidney. the series of physiologic uterine, ovarian, and other changes that occur in higher animals, consisting of proestrus, estrus, postestrus, and anestrus or diestrus. The recurrent set of physiological and behavioral changes that take place from one period of estrus to another. The series of cyclic uterine, ovarian, and other changes that occur in higher animals. a reproductive cycle caused by the cyclic production of gonadotrophic hormones by the PITUITARY GLAND. It occurs in adult female mammals and is only complete when pregnancy does not occur. It lasts from 5 to 60 days, dependent on species. Initially, follicle growth occurs in the ovary as a result of FOLLICLE-STIMULATING HORMONE being secreted by the anterior pituitary This results in increased OESTROGEN production and a thickening of the uterus lining. The build-up of oestrogen results in positive feed-back, causing the anterior pituitary to produce LUTEINIZING HORMONE which in turn brings about ovulation with the formation of a CORPUS LUTEUM, development of the uterine glands, secretion of PROGESTERONE by the corpus luteum (which inhibits FSH production) and a consequent decrease in oestrogen production. Fertilization may occur at this stage and if it does so, pregnancy results. If not, there is a regression of the corpus luteum and a feedback to the anterior pituitary to produce FSH as progesterone decreases. New follicles are formed, the lining of the uterus thins, menstruation (see MENSTRUAL CYCLE occurs in human females and some other primates, and there is a cessation of progesterone secretion and a continued decrease of oestrogen. The cycle then begins again as new follicles grow. Only during the initial period of the cycle, during which ovulation takes place, will the female of most mammalian species copulate (the period of ‘heat'or oestrus). pertaining to or emanating from estrus. one of the two types of reproductive cycles, the other is the menstrual cycle of humans and primates. Regularly occurring periods during which the female is sexually active and receptive, estrus, separated by periods in which there is no sexual receptivity. This period is divided, on the basis of ovarian activity into metestrus (early corpus luteum development), diestrus (mature corpus luteum) and pro-estrus (period of follicle development). The details of estral activity are summarized in Table 17. A complete estrous cycle was observed in only 2 females, in which the three basic stages of the cycle (proestrus, estrus, and metestrus) were observed (Fig. To determine the expression of mRNAs for PG transporters ABCC1, ABCC9, SLCO4C1, and SLCO5A1 in the porcine uterine endometrium during the estrous cycle and pregnancy, we performed real-time RT-PCR analysis (Figure 1). Effect of hCG administration on day 7 of the estrous cycle on dynamics and cycle length in cows. It is concluded that Anethum graveolens seed aqueous extract both in low dose and high dose increased estrous cycle duration and progesterone concentration and induced infertility without any significant adverse effects on oocytes' developmental potential such as structural and chemical changes. The duration of the estrous cycle in this study showed no significant differences when comparing BN to BM nor when comparing the number of waves of follicular growth. CNS al receptor in tonic pain during estrous cycle in rats. histochemistry across the estrous cycle in hippocampus layers, which allowed us to determine the distribution C.
Based on the results of a previous study (5), estrous cycle phase was determined by impedance readings. on gonadotropins, ovarian follicular kinetics and estrous cycle for screening of antifertility activity in albino rats. Cellular types and the proportion among them allowed the observer to define the estrous cycle phase of the rat. Changes in the ovarian dynamics and endocrine profiles in goats treated with a progesterone antagonist during the early luteal phase of the estrous cycle. A few of the older does in the herd will hit their first estrous cycle, so you may see some early rutting activity before the big show or main event actually kicks off.